1. How govt job interview is different from private job interview? - Govt sector interviews are different from pvt sector in many aspects like - pattern of conducting interview, type of questions asked, marking method, checking skills and suitability, body language etc. 2. How to prepare for govt job interview? - There is a special booklet on this topic in this kit. You will get detailed guidance for this. You have to prepare yourself for the interview in 3 ways. (i) Self preparation (ii) Help from Friend (iii) Help of Teacher or Study Material prepared by expert. 3. Who need this kit? - Every candidate who is seriously preparing for government job examination should read this kit. 4. When should I buy this kit? - You can order this kit anytime. You may order it immediately after your written test. It is ideal to order Interview Guidance Kit before your written exam. 5. What is better- classroom course or correspondence course? - Both are useful provided quality is maintained. Career Quest provides you both the courses separately with the same quality. 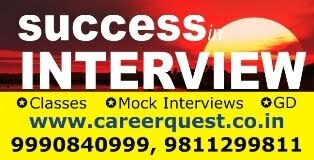 You may join Career Quest Institute for Interview Training in Delhi. If it is not possible, you can order this kit at your home. 6. Who prepared this kit? 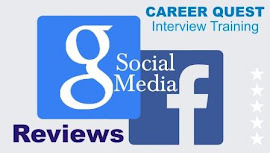 - This kit is prepared by Sanjeev Kabeer sir who is known for best interview guidance. This kit is a outcome of his long experience and expertise in the field of govt interview guidance. 7. What benefit I will get if I buy this kit for my interview preparation? (i) Chances of success in interview increase. (ii) You gain confidence to face the interview or GD. (iii) You avoid mistakes during interview. (iv) You get quality inputs and guidance at your home. (v) You save money on visiting class, fees, lodging etc. 8. Is it possible to improve personality by reading this kit? - Certainly yes. If you follow the steps given in this kit, your personality will be polished. Basically this kit is not personality development kit. This is govt interview guidance kit. But it helps to make you more suitable for govt job which you are applying. 9. For which govt exams this kit is useful? 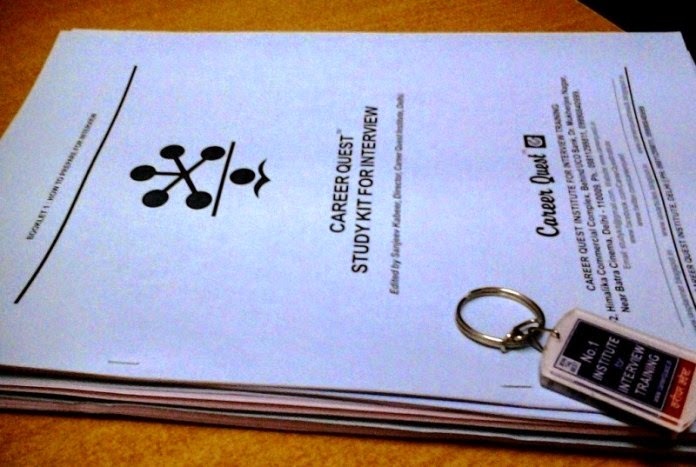 - Career Quest Interview guidance kit is useful for all govt exams. Like IAS, IPS, Civil services, Bank PO and Clerk, SSC, Judiciary, State PCS, Insurance, IB ACIO, Teacher, All UPSC exams, CAPF, FCI, SEBI, RBI, Prasar Bharati, Admin officer, IBPS, SBI, PSU, SSB etc. 10. All the above mentioned exams are having different pattern. How this kit is useful for all? - Yes. All the above mentioned exams have different patterns. But basics of the interviews remain same. Preparation method, Biodata related questions, Body language, current topics, method of judging the candidate is almost similar in nature. Level and focus of the interview is different. This kit is prepared considering all the aspects of your interview. Also we add extra booklet according to your examination, if required. 11. Is it required to mention exam name while ordering this kit? - Yes. You should inform us the name of the examination you appeared for. So that we can provide you suitable kit for your exam. 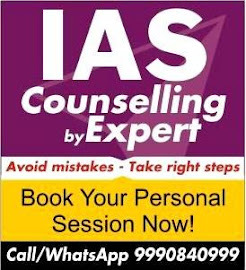 For example if you are appearing for IAS interview, we will send you 1 extra special booklet suitable for your interview. If you are appearing for bank interview, we will send you 1 extra booklet for banking awareness. 12. I can do good conversation. Why I should use this kit? - If your communication skill is good, it is added advantage. But you should not think that nothing extra left to learn. There is always possibility of learning new things in many ways. A good teacher and good student should never think that there is nothing more to learn. We can surely say that you will learn many new things about govt interview from this kit. 13. What is included in this guidance kit? * Booklet 1- How to prepare for Interview? How to do complete preparation? * Booklet 2 - Body Language basics for govt interviews. * Booklet 3 - Biodata related questions and suggested answers for govt job interviews. * Booklet 5 - Guidance by experts and toppers to succeed in interview. * Blank feedback sheet, biodata sheet added for home practice. * Concession form to our classroom course. 14. What extra services are available with this kit? - If you order this kit you can avail our other services at extra cost. You can add the following services while ordering the kit. 14. What is the price of the kit? - At present fee for printed booklet kit for interview is Rs.1500. You can add other services by adding the fees for it. Details of payment are given below. If you have any question or doubt about this kit in your mind just sms us at 09990840999. FREE DELIVERY IN INDIA! Free shipping! We deliver your kit at your address at no extra cost. You have to pay only for kit price. * Extra charges are aplicable only for International Delivery. How to order the kit or notes? 2 - Inform us by call/SMS or email when you deposit the fees. Email :studykit@gmail.com Call or SMS : 09811 29 9811 or 09990840999. 3 - After confirmation of your fee payment, we will send you the kit as per your order by Courier or Registered Post at your given address. It will reach to you in a week. OPTION 1. Send DD or Cheque in favour of 'CAREER QUEST' payable at Delhi. OPTION 2. Deposit Cash in any ICICI BANK or BANK OF INDIA branch near to you. OPTION 3. Transfer money online if you have taken internet banking facility of your bank. OPTION 4. Visit personally or send your representative to our Delhi office for payment. A/c. No. - 03400 500 1217. 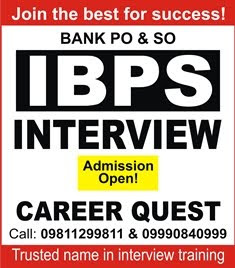 Make a DD/Cheque in favour of CAREER QUEST, Payable at Delhi, and send it to the following address by Post or Courier. Institute for Interview Training, M-2, Himalika Commercial Complex,Building No.5 and 6, Behind UCO Bank, Dr. Mukherjee Nagar, Delhi - 110009. Email: studykit@gmail.com Phone: 09811299811, 09990840999. Call 09811 29 9811 for any help or query about kit.